Sleep is overrated, as the old saying goes. But does this stand up to modern scientific research? The Centers for Disease Control and Prevention in the US (CDC) has now declared insufficient sleep to be a public health problem. And the US isn’t alone in battling it. A lack of sleep is an increasing problem across western economies. This is the finding of new study entitled Why Sleep Matters – The Economic Cost of Insufficient Sleep . The study was conducted by the Rand Corporation, a non-profit global policy think tank. Insufficient sleep can have a dangerous effect on your health – increasing mortality risks - but can also have a negative impact on academic achievement and personal productivity levels. This means that a lack of sleep and its consequences do not just affect healthcare systems, it can affect entire economies. People are sleeping less and less due to lifestyle factors including alcohol consumption, smoking, stress and lack of exercise. Our ‘on-demand’ society and economy and excessive use of electronic media also take their toll on our ability to sleep, the report says. By far the biggest reduction of sleep time is caused by mental health issues, financial worries, time pressure at work and the impact of long-distance commuting. There is also a gender difference, with men sleeping nine minutes less on average than women. An individual who sleeps less than six hours per night on average has a 13% higher mortality risk than a person sleeping between seven and nine hours. For “in-betweeners” who get six to seven hours of sleep, the mortality risk is still 7% higher for all causes of death, including car accidents, strokes, cancer and cardiovascular disease. Which countries lose the most from a lack of sleep? Those who sleep less than six hours a day report a 2.4% higher productivity loss than workers who sleep for the recommended seven to nine hours. This means that theoretically, an employee who gets too little sleeps loses around six working days per year more than a worker who gets sufficient sleep. 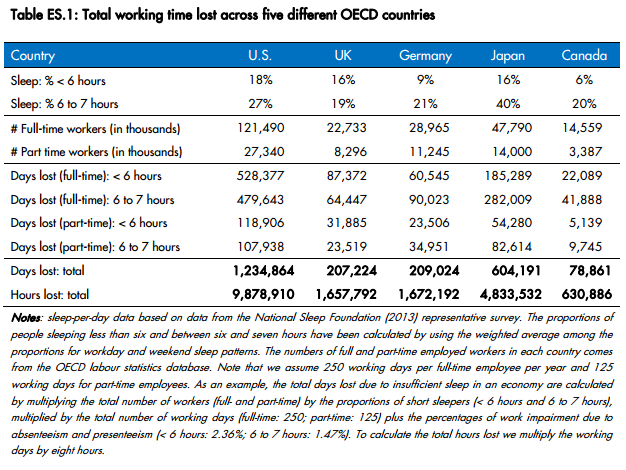 Extrapolated on a country basis, the US loses about 1.23 million working days due to lack of sleep, followed by Japan with which loses around 600,000 working days on average, and the UK and Germany where the theoretical losses amount to just over 200,000 days. Out of the five nations surveyed, Canada loses the least working time, at less than 80,000 days. The study concludes that lack of sleep affects the supply of labour in a number of ways. Due to increased mortality risk, the working population is reduced in size; sleep deprived employees are more likely to be absent from work or perform less well at work; and children’s skill acquisition will be slowed if they don’t sleep enough. An analysis of the performance of normal sleepers compared to sleep-deprived workers highlights the enormity of the problem. While the percentage loss relative to GDP seems small at first sight, the amounts are staggering. 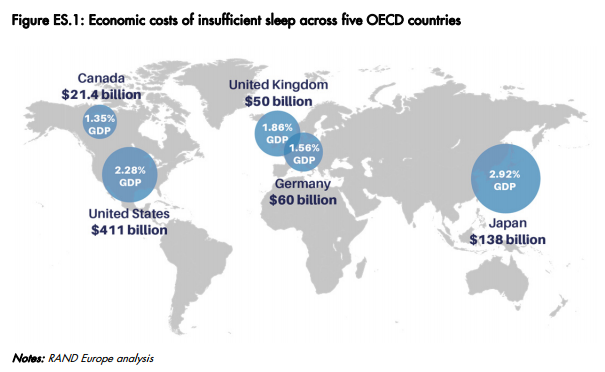 Sleeplessness costs the US over $400 billion, with Japan losing $138 billion. Germany and the UK follow with $60 billion and $50 billion, and Canada at $21 billion. The Rand researchers conclude with a series of recommendations to address the problem. At the personal level, having a set sleep routine with a regular wake-up time, exercise and avoiding stimulants such as caffeine or nicotine can all have a positive impact. From an employers’ perspective, discouraging the use of electronic devices close to bedtime and promoting good sleeping routines should help staff get more rest at night. In terms of sleep promoting public policies, the report suggests public awareness campaigns and introducing later school starting times and more effective schedules to ensure adequate sleep for youngsters.